Eider Motors, a relatively new and unknown two wheeler maker based out of Hyderabad, has been partnering with various companies from China, Japan, US and so on to get its business up and running. The latest attempt at establishing its brand in the Indian two wheeler market sees introduction of Chinese motorcycles from CFMoto. Photographs from Motorbeam.com reveals that the CFMoto models are already on display at Eider Motors showrooms. 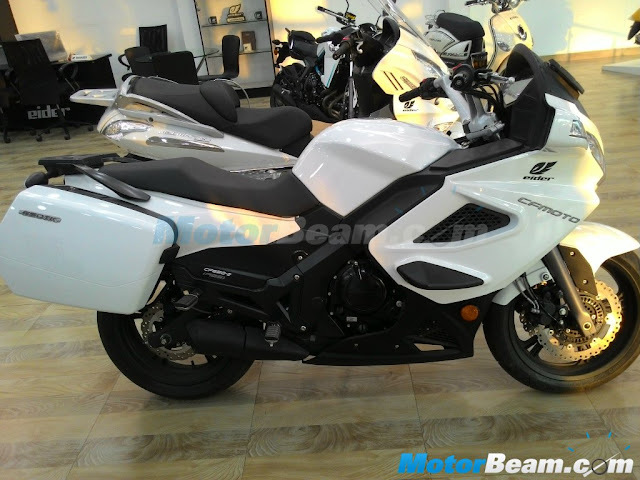 The Indian company is reported to start selling four CFMoto models namely 650NK, 650TK, JetMax 250 and 150NK. 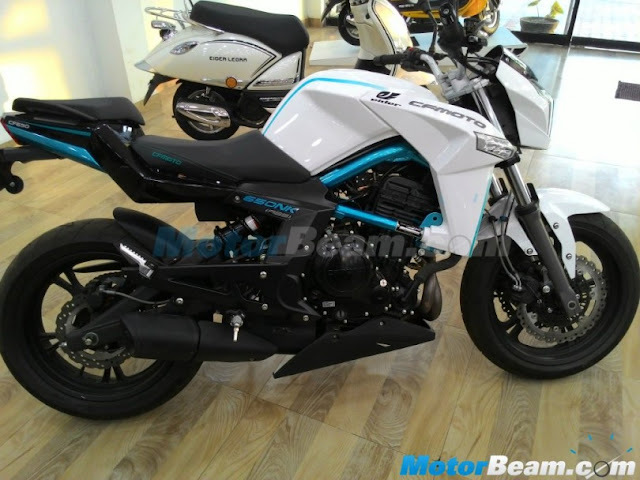 The CFMoto 650NK is a naked street fighter that employs a 650 cc liquid-cooled twin-cylinder engine which is good for 55.7 bhp and 62 Nm of torque. The motorcycle is equipped with KYB front telescopic fork and rear monoshock. The 650TK is faired sports tourer based on the same platform. The engine output too is identical. The Jetmax 250 is a premium motoscooter which targets touring enthusiasts. The automatic scooter packs a 250 cc fuel-injected, water-cooled engine which pumps out a decent 22.45 bhp and 21 Nm of torque. A standard back rest and MP3 player enhances the scooter’s touring credentials. The most affordable model is the 150NK street fighter which is listed on Eider’s official website under the name Dave. The bike’s 150 cc liquid-cooled engine generates 14.3 bhp and 12.2 Nm of torque. It remains to be seen if these bikes will be imported as CBU or CKD. Details on pricing are not available as of now.